What I'm about to tell you could change your life forever... You know the NY ramen restaurant Ippudo? The one that ALWAYS has a huge wait to get a table? Well, I'm going to tell you how to stroll on in there and sit right down to eat. I know what you're probably thinking: "But Sam, if you tell millions of us your secret, won't that ruin your trick? You are such an amazing altruistic person. I'm so lucky to know about your blog. May wonderful things happen to you in return for your generosity. An angel you are, Sam! Sent directly from up above! You must have wings, Sam. Straight from heaven, Sam!". And you know what? That's probably all true. Except the wings part, ewww, gross! But back to my trick....If I can save you the wait at Ippudo, it is well worth it! That's just the kind of person I am. You can thank me later (by sending me a check, or finding me a husband, or baking me cookies etc). So here's the secret: GO EARLY! I'm talking early bird special early! If you get to Ippudo by 5:30pm on a weeknight (doesn't work on the weekends), you will most likely be seated immediately. Fine, maybe no one really wants to eat that early in the evening, but trust me once you have that scrumptious bowl of heaven sitting in front of you, you'll feel hunger like you've never known! 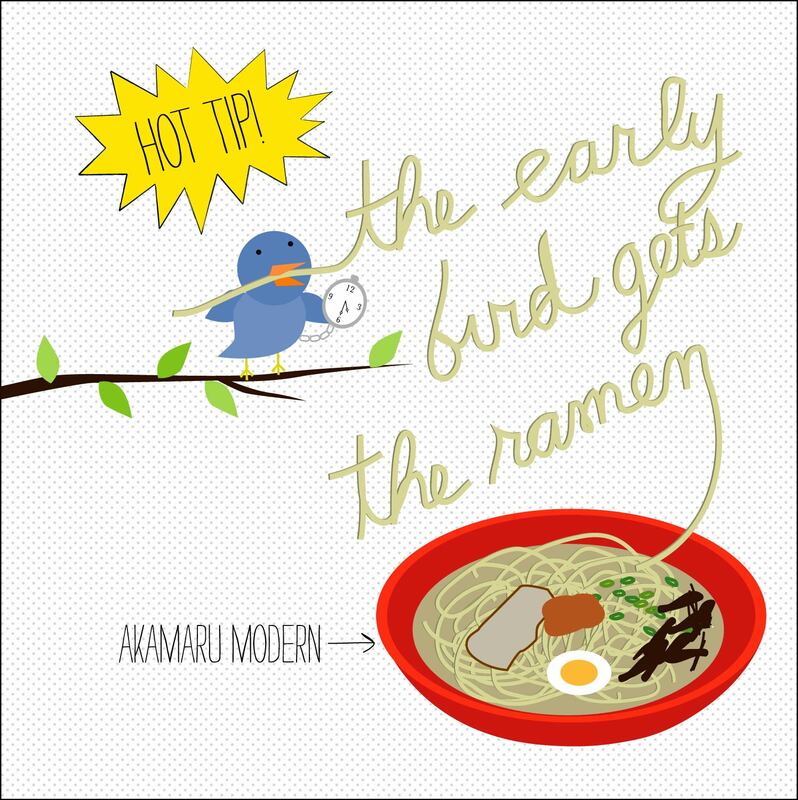 I recommend the Akamaru Modern ramen (make sure you order with a soft boiled egg. It's $2 extra, but it might be the best $2 you ever spend in your life! ), it is dreamy! You're welcome. You owe me one!